The 1930s turned out to be something of a golden age for infrared photography, as photographers could now buy infrared plates 'off the shelf' rather than having to sensitise themselves. This would also have made exposure more predictable. For example, UK newspapers, notably the Times, published many such photographs between around 1932 and 1938. The interest was almost exclusively around the haze penetrating properties, allowing for long-distance photography, especially from aircraft. For this reason infrared photographs showing the Everest range were some of the images taken on the 1933 Houston Everest Aerial Expedition. Among the photographers availing themselves of the potential of infrared photography was New Zealand photographer Havelock Williams. 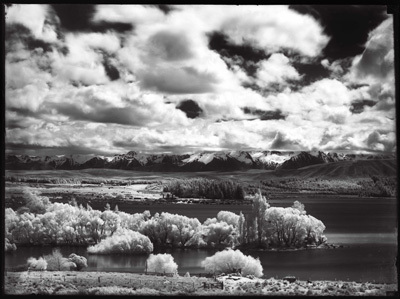 At this time he was living and working in Timaru in South Island and his daughter, Diana Rhodes, tells me "Infra-red photography was in his output around 1934, on large format glass plates of the South Island Scenery". It is unclear what stock (or stocks) he used and even whether he sensitised the plates himself. Diana has a box labelled Ilford Hyper-Chomatic Films, where her father has written 'Infra Red Albury' (if I can decode correctly), but I don't even know whether this was a box for plates or for prints of some of his IR images. Diana collated and edited his work to produce a book, With my Camera for Company, if you'd like to explore his life and work further. The Amazon UK link isn't as helpful as it might be, but if you're in New Zealand (or don't mind air mail) then this link is better.